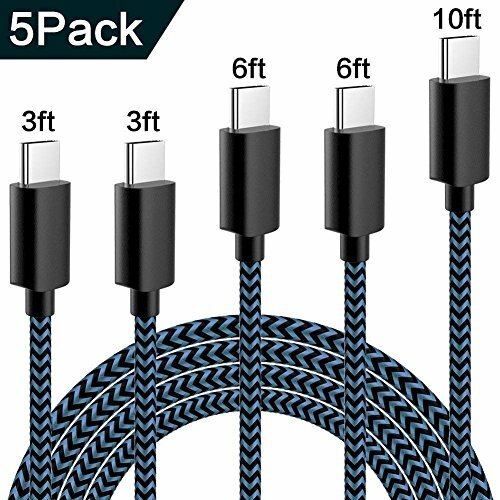 TNSO USB Type C Nylon Braided USB A to USB C Charger Cable Fast Charging Cord for Samsung Galaxy Note 8 S8 Plus, LG G5 G6 V30, HTC 10, Nexus 5X/6P-Black&White (black&blue) by TNSO at All Company Mobiles. Hurry! Limited time offer. Offer valid only while supplies last. Made in Superior Copper makes sure charge your Type-c devices 2 times faster than normal charging cables. Our cable is shielded by premium Aluminum alloy which is more durable and convenient. And nylon braided cable is hard to break and long enough for you to make call, watch TV or play games in the living room & bedroom, no need to stay by the wall charger and wait for your phone full charge. 12 months warranty is guaranteed and we promise to help you solve any problems within 24 hours.